It was now the year 1963. There would be just one more Hodgson from Southfield that would move to the United States of America. However, the Hodgson Emigrants moving from Jamaica into the United Kingdom were complete. Three of these family members were yet to marry. There were now 1st generation Hodgson’s being born in England, myself being one of them. My dad’s youngest brother Colin Hodgson had been dating a teenage Jamaican Girl, Laseta Waite. She lived at the top of Jesson Street, not far from Cecil & Helen Hodgson’s home. 1956/57 Jesson Street. An Unknown Wedding. Colin Hodgson & Laseta? Are On The Left, Aunt Helen Is 4th From Left. My Dad, Renford Is Second From Right Standing In Between A man Named Halden & His girlfriend. ‘Uncle Halden’ Would Later Turn Out To Be One Of My Dad’s Best Friends. Another ‘West Bromwich Hodgson’ got wed when my dads youngest brother, Colin Vern Hodgson married Laseta Waite at Saint Andrew’s Church, Carters Green, West Bromwich. At The Alter, Saint Andrew’s Church. My Sister Joan Is The Shortest Bridesmaid On The Right. My mom and dad were living in West Bromwich, not far from this church. Being a small boy, I held no memory of Uncle Colin. I was just two and half years old at the time of his marriage. My eldest sister Joan, however, was present as a bridesmaid and stood at the altar of Saint Andrew’s church, alongside the bride and groom. Joan was also present at their signing of the marriage register. The after wedding party was yet again held at Cecil and Helen’s Jesson Street home, which was the established hub of the Hodgson family in West Bromwich. Three children would soon be born to Colin and Laseta in West Bromwich. 1963 Colin & Laseta’s Wedding Reception Was Held At Jesson Street. His Aunt, Helen Hodgson Would Almost Certainly Have Made His Wedding Cake. Colin’s Cousin, Shirley Hodgson Can Be Seen In The Background. I Wonder If Any Of You Spotted The Two Black Silhouette Figures Of Cupid? 1963 was also the year that the 35th American president, John Fitzgerald Kennedy was assassinated in Dallas, Texas. Just Moments After This Photograph Was Taken, President Kennedy Was fatally Shot. The years were now moving on quickly…. My family was now settled at Nelson Street in West Bromwich. My dad Rennie had wanted to be an electrician since being a young teenager in Jamaica. With his thoughts firmly focused on this occupation, he left Tube Products Works, Oldbury and moved to West Bromwich to work at a company in Church Lane. Soon afterwards he managed to find jobs there for his cousin Ainsley, and his youngest brother Colin. Dad enrolled into West Bromwich College studying one day a week learning to be an electrician. His brother Colin had hoped to be given a room at our Nelson Street home, but with Mom and dad now having five children living in our small house, dad decided there was not enough room to house his brother and his young family. 1965 Nelson Street, West Bromwich. From The Left Is Joan, Dad Holding Susan. The ‘Happy One’ In The Middle With The Lovely White Shoes Is Me. There Had Been A Big Scuffle, My Two Brothers Were After Them. Next Is My Mom Holding Michael, And On The Right Is Vernon. My Youngest Sister Sandra Was To Be Born 6 Years Later. Work opportunities had arisen overseas in Canada. Colin, his wife and their three West Bromwich born children emigrated there in 1966. They settled in the city of Ontario. Colin & Laseta’s marriage ended many years later. He later married his second wife Audrey Patricia Simpson. In Canada, Colin & Audrey went on to have three children. Being a young boy of about 5 years old when Uncle Colin left England, I held no memories of him. I did however grow up hearing his name with an understanding that he lived in Canada. As an adult many years later, I saw him properly for the first time when he visited England in 1979. Three more West Bromwich Hodgson’s would marry in the upcoming years. Shirley in 1971, Ainsley 1977 and Astley in 1994 …. There were now branches of Southfield Hodgson’s spread out far and wide at Southfield, New York, West Bromwich, Oxford and Canada. “This has been yet another very enjoyable blog to write. Exactly twenty years after Aunt Helen made that ‘1963 Jamaican Wedding Cake’ for Uncle Colin’s wedding reception party, she also made one for me at my West Bromwich wedding in 1983. Just recently when I was looking at Colin’s wedding photographs, I noticed that the cake had two black-silhouetted figures of cupid placed around it’s base. Such a nice touch! I can’t remember ever noticing if Aunt Helen placed any cupid’s on my ‘Jamaican wedding cake’ I will have to search through my albums to check. I adore our old black & white photographs, there is just something unique about them, no colours to distract you. What you see in these pictures is a story. I am so much enjoying displaying Cecil’s lifetime collection to everyone. Interesting to view pics of my parents I am one of the three kids of Colin and Lasceta Hodgson..
Hi Michael, I was told your three names when I first started up nearly 20 years ago. I know quite a lot about the Hodgson’s but have never really known much about your branch. It was only a few months ago that I started asking my dad about your dads emigration to Canada. Infact, I didn’t know that your mom went to Canada too, I thought she may have remained in England. I might have a few more photographs of your mom and dad. I will put them on the blog eventually. If you need anymore information please email me. 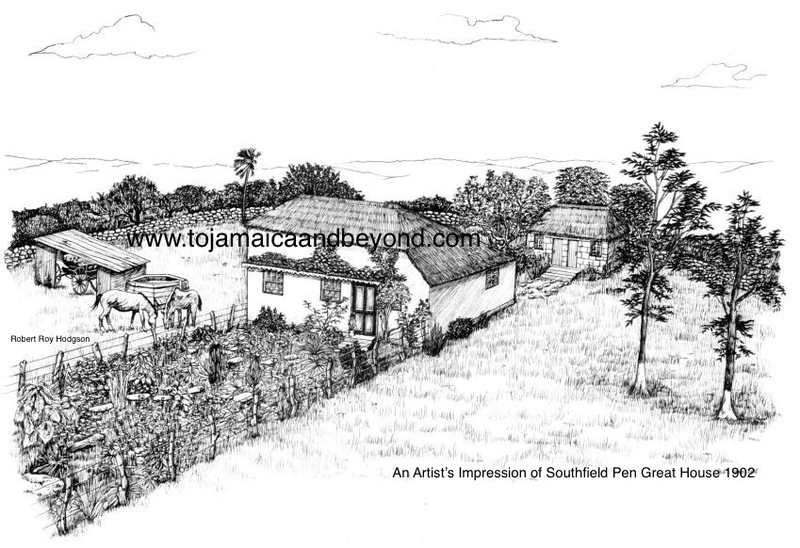 Thanks for reading ‘To Jamaica and Beyond’ Michael. Wow Michael, I’m so glad you saw those photo’s of your parents, they are the originals. It’s lovely having black and white photos of family. I’ve got a full photo album with over 500 of them! Despite the fact that I’ve coloured many for my own pleasure, I still treasure the originals and I’ve always said that if I had to rescue one possession it would be that album. These of yours are so typically 1960s. 🙂 I’ve very few from that period (when I was a teen with typical teenage angst and hated having my photo taken) so it’s lovely seeing other people’s. 500, that’s a huge collection Val, especially black & white photo’s. That’s amazing! Make sure you have have copies! Dont you think there is just something unique about them compared to colour. Saying that though, I really like the ones that you have worked on and coloured and I’m looking forward to choosing one or two from my collection for you to work on next year. When I was 16, I took up and studied photography (1977) this lasted for about 5 years, so I also have a big collection, maybe as many as 500, of mainly colour photo’s and slides. I once worked at a photo agency as a ‘darkroom technician’ for about 6 months processing their prints and I also covered a few friends weddings in black & white. Oh yes, and I also used to develop and print black & white before moving on to colour in my first flat. I really enjoyed it. Good that you worked with photography – I think a lot of people who now only know digital don’t realise what was involved (or how expensive film was for most people). Have you seen any of the autochromes or photochromes from earlier years? They’re quite amazing. I’ll be happy to colour your photos – let me know when you’re ready. 🙂 In the meantime, enjoy what you have. Hope you are having a good christmas Val. Yes the old monochromes really were excellent. You are right about it being expensive and we had to wait ages for our photos to come back from the processing lab didn’t we. I remember a few times recieving blank ruined prints back, I had paid all that money and the films sometime came back ruined. The good old days? Infact my next blog, to be posted in a few days, includes a bit of information about the days of 35mm film. Your blog and the work you do is excellent. I am quite excited and looking forward to eventually seeing my favourite photographs reproduced in colour! Enjoy the rest of your holiday. Ok enjoy your break when it arrives Val.